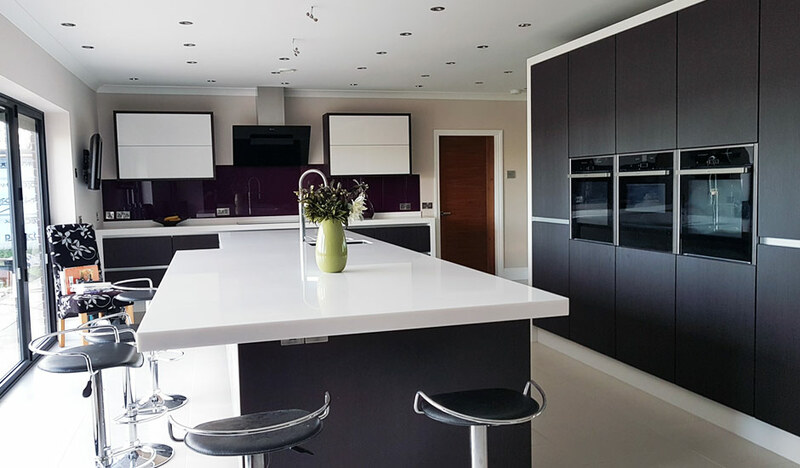 Modern Kitchen Installation in Birmingham – White High Gloss and Oak Combination. 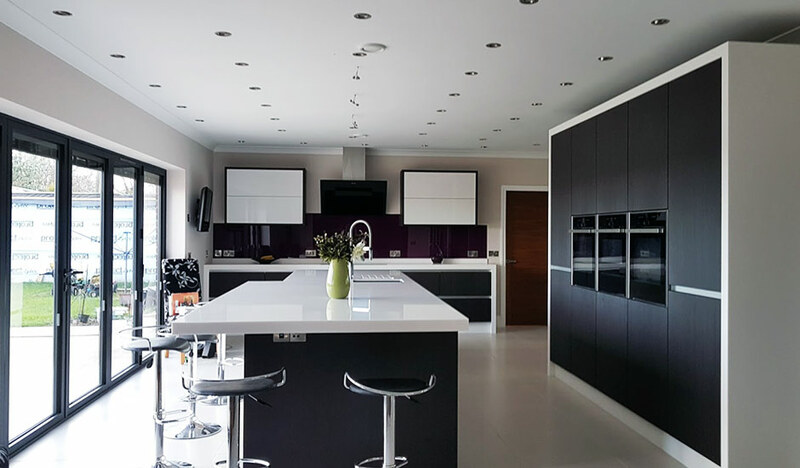 Modern kitchen installation in Birmingham. Anna & James visited us with clear idea about the look they are trying to achieve in their new kitchen. 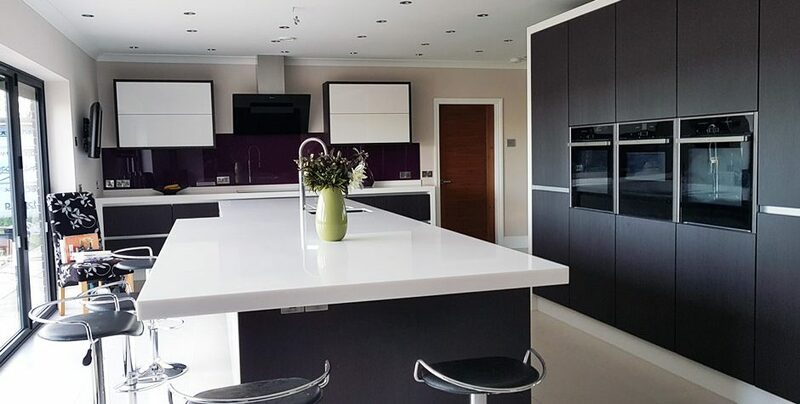 They wanted to create two tone combination of wood effect and white high gloss kitchen doors to create balance between natural and modern decor. 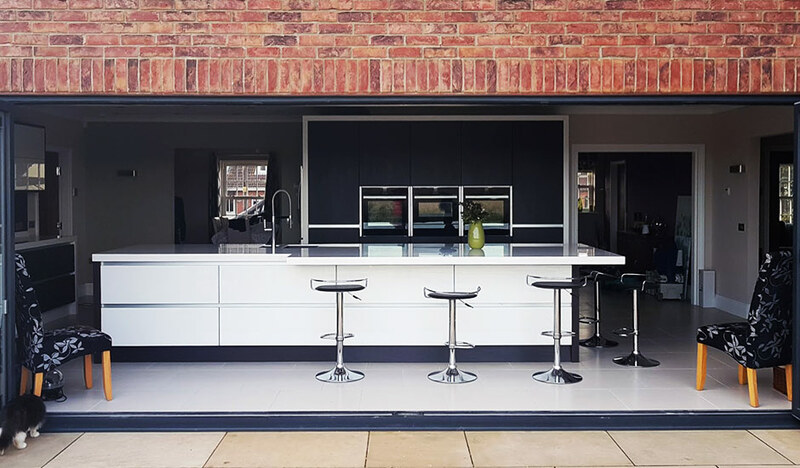 With large sliding bi-fold doors which lead into the garden, high gloss white kitchen island would provide them with great light reflection and run of wood effect tall bank units would create more natural and muted decor. 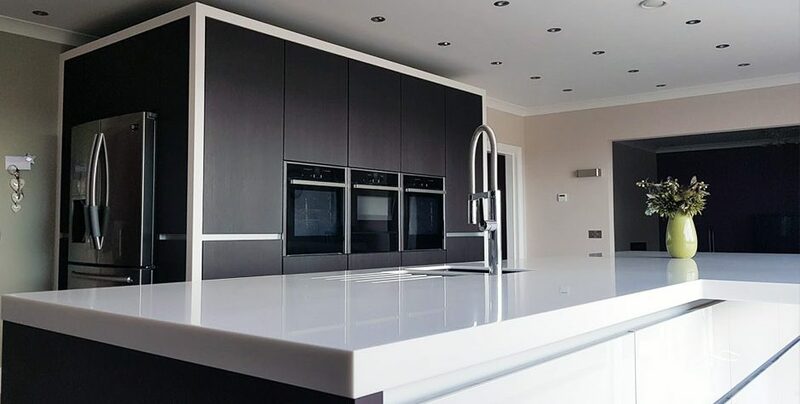 They wanted a true handleless bespoke German style kitchen which features aluminum profile and wanted to keep the drawer line throughout the kitchen design. 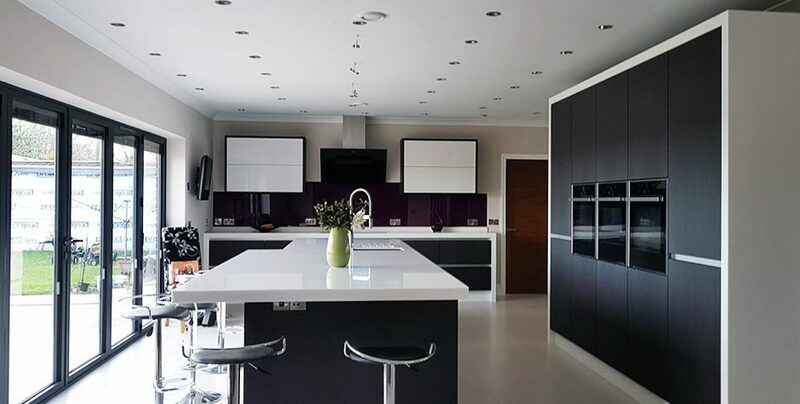 One of the unique & challenging features of this kitchen is that tall bank of units is cladded in Tristone solid surface material creating boxed in style that creates true bespoke kitchen decor. 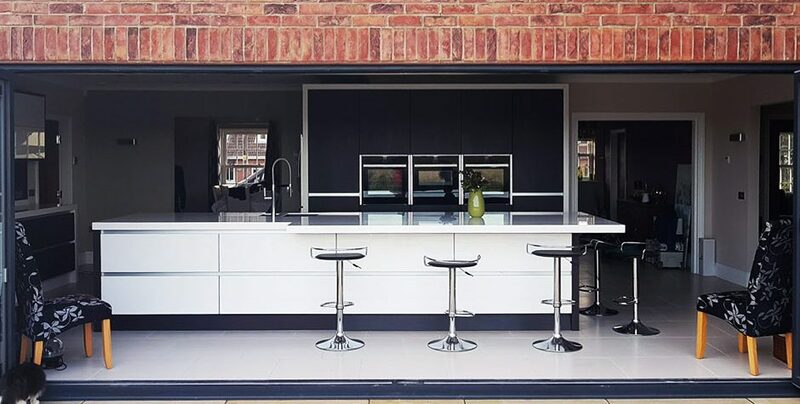 In terms of doors designs they decided to pick combination of Malinga Oak and white acrylic kitchen doors with glass effect edging which works great in combination with aluminium profile. Both of the kitchen doors they selected are bespoke made to any size required. Island consists of 8 drawers in total. 6 of the drawers are pan drawers and 2 are pan drawers with small internal drawers. Cabinets are made out of U961 Graphite Egger MFC and feature white front edge to match colour of the doors. The island worktop is made out of Tristone Snow Pearl which is an off-white colour with subtle metallic sparkles. Worktop features overhang section which creates seating area for the whole family. Island also features 60mm end panels made out of Truffle Brown Avola Egger laminate. Tall units bank features horizontal finger rail and Malinga Oak kitchen doors. The ovens section uses push to open mechanisms above and under ovens. Push to open mechanisms allows doors to be opened without handles and with single push to the door. 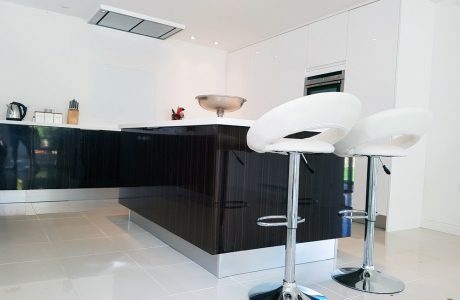 Whole run of tall unit is boxed in with 60mm Solid Surface that matches the worktop design. It also features American fridge freezer which adds to functionality of kitchen. Wall run section features 60mm Tristone Snow Pearl worktop surface with side legs seamlessly jointed to the worktop with no visible joints. Customer choose custom RAL colour for their kitchen splashback to add a touch of colour to the kitchen decor. Two bi-fold kitchen units feature 25mm bespoke made panels made out of Truffle Brown Avola Egger laminate. 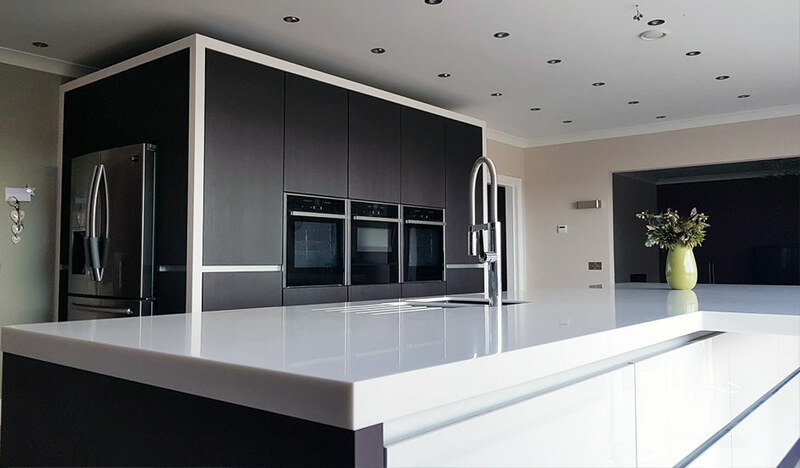 We fully designed and supplied all of the kitchen furniture, glass splashbacks, made the worktops in our workshop in Birmingham and cladded the tall units in solid surface material. We would like to thank Anna and James for choosing us for this project and we truly enjoyed working with them on their new kitchen. 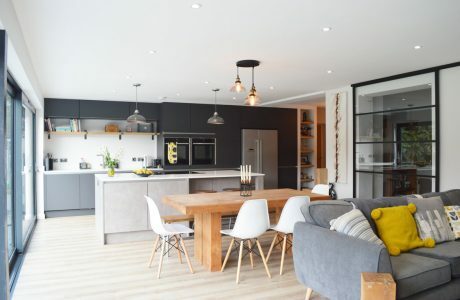 If you are looking for truly bespoke kitchen design and kitchen furniture in Birmingham give us a call on 0121 663 1535 or email us on info@twotonekitchens.co.uk.